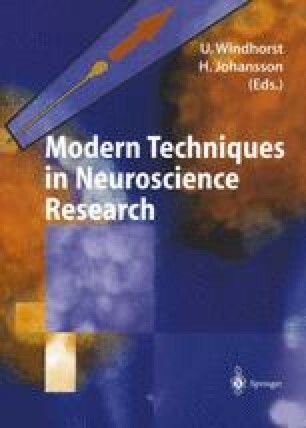 Invasive techniques for continuous in vivo monitoring of substances involved in chemical neuronal signaling and cellular metabolism have became an integral part of the experimental armamentarium within the fields of functional neuroanatomy,neuropsy-chopharmacology and neuropathology (Boulton et al 1988; Justice 1987; Marsden 1984;Robinson, Justice 1991). A target place for most of the in vivo sensing devices is the extracellular space filled with the fluid which under normal circumstances comprises about 20% of the total brain tissue volume. It is suggested that the ionic composition of the extracellular fluid (ECF) is the same as the concentration of ions in the cerebrospinal fluid, due to the absence of tight junctions between ependymal and pial cells. However, the ECF consists also of a number of long-chain glycosaminoglycans, proteoglycans and glycoproteins tethered to membranes, and generally, it contains higher concentrations of nutrients transported from the blood capillaries to the cells and metabolic molecules moving in the opposite direction. Neurotransmitters and neuromodulators released from the nerve terminals as well as neurotrophic factors and other cytokines all have to traverse the extracellular space on their way to the target receptors. Recently, the concept of synaptic transmission was broadened under the term volume transmission incorporating these inter-cellular communications over the long distances (Fuxe, Agnati 1991). It is believed that there is a slow movement of the ECF towards cortical subarachnoid space, ventricles and the perivascular Virchow-Robin space.